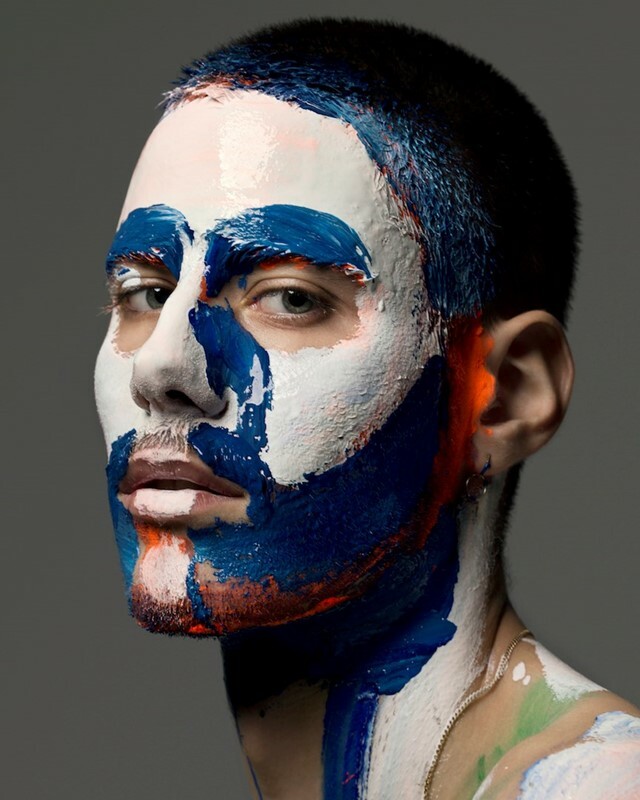 Photographer Pierre Debusschere is well-known for his fashion editorials. 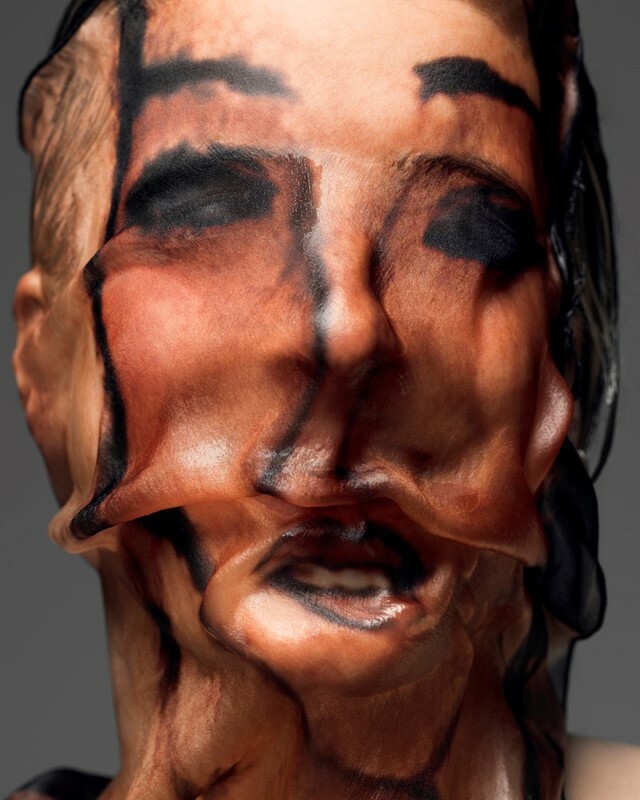 The Dazed contributor has worked with designers including Raf Simons, Louis Vuitton, and Dior Homme, captured the likes of Michele Lamy and Die Antwoord for the pages of the magazine, and created music videos for Actress and Beyoncé. For the most part, his subjects are usually seen wearing clothes – that is, until now. This weekend Debusschere debuted his first solo exhibition, UNcovered, at Brussels MAD showspace. Featuring 90 original pieces and a unique audiovisual installation, it documents a series of models who stripped off and stepped out in front of the photographer’s camera, exploring what it means to ‘uncover’ and the intimacy of removing the garments you wear. Also adding a protective layer to subjects was oil and acrylic paint, which Debusschere used to make markings on models’ bodies in colours that represented light and shadow, as well as rolls of fabric which he swathed about a number of individuals. It was, he explained, a way to keep a connection to his work in fashion, albeit in an unstyled way. Also on his mind were the decorated ceilings of religious buildings, from where the idea for the exhibition’s film installation came from. Set in a darkened room in a space at the centre of MAD, visitors are encouraged to lie on a platform under a screen – surrounded by the blankets like those worn by the models featured in the show – to watch a 16 minute-long original film in which a number of models interact with each other, reciting intimate prose as they move. “I wanted there to be this unique, physical experience within the exhibition,” Debusschere says. “The music is inspired by a heartbeat, and the bass under the platform is turned up very high so it reverberates through the viewer’s body. The screen is very low, and very close to you, too, which again was all about this feeling of protection.” The film finishes with James Massiah’s spoken word piece You Ain’t Gotta Go Home, which acts as an interlude to what is an intense, emotional experience. The exhibition isn’t necessarily the last of Debusschere’s exploration into intimacy and protection. A year in the making, UNcovered, in his mind, could well be an ongoing series. “I chose to show in Brussels as I was excited about moving back here from London, there’s a lot going on,” he says. “But it’s something I’d like to take to other cities, perhaps, in the future.” Look out for him – and his camera – at a house party near you. UNcovered is now open at MAD Brussels and runs until September 30. Entry is free.